capturing all data inside and outside of your fleet vehicle. This system is integrated into one self-contained unit which makes it unlike any other product on the market. With the ability to upload HD quality Video to your Server or computer, you will have the ability to manage your fleet without all the hassles of collect data from each camera. Views and records the interior and exterior of the vehicle providing a 170 forward facing camera, along with a 170 degree rearward facing camera for a total view of inside and out. Upon replaying your video, the integrated GPS technology shows vehicle locations with multiple map options. Included with the camera is a polished software program that categorizes video/audio, GPS locations, alerts, and more into an easy to learn user interface. Infrared light immediately initiates night vision recording during dark hours. The camera can be optimized with a WIFI adapter which enables automatic file downloading to a specified computer. The camera continuously records at all times, capturing dual camera audio/video, MPH and KPH speeds, GPS location, and events. This system automatically begins priority saving when an accident occurs, a high impact occurs (braking/accelerating), or for over speeding. Additionally, it features an emergency trigger button near the driver to manually begin recording at any time. Custom display windows allow you to view what’s important at larger resolutions. Additionally, the data is distinguished by categories including impact, speeding, normal mode, emergency triggered, and more. Data is stored on an SD Card allowing up to 128GB of storage. Route’s can be reviewed using the camera’s map sensor. The Valor System offers a variety of accessories to customize your system so that it will accommodate your needs appropriately. Whether you need additional storage space, locking mechanisms to prevent tampering, or our popular WIFI adapter to automate downloading, we have the products you need to optimize your fleet. Our WIFI adapter utilizes modern wireless technology and integrates directly into this system. The adapter enables automatic data downloads which eliminates the need to individually retrieve SD cards from each unit. Upon parking at the end of a shift, the camera’s data is automatically sent to a designated computer wirelessly. It’s as easy as that. The additional storage space on the 128GB SD card greatly increases the amount of data the camera can save and decreases the amount of times you’ll have to manually download data from the card onto your computer. You’ll know if an employee has disconnected a camera, but sometimes they’d rather disconnect the camera than have you see something that occurred. Make this behavior an impossibility with the camera’s locking mechanism that prevents any tampering. Valor System allows you to test our Car Camera DVR Software with sample data to better assess how the camera can help your business. Follow the steps below to test the software for free. Step 1: Download and install the camera viewer software here. Step 2: Click here to download a zip file which contains sample data in a JDF format. Step 3: After the software is installed, unzip the JDF files and double click them. The DVR software will automatically open, simply press play to begin. 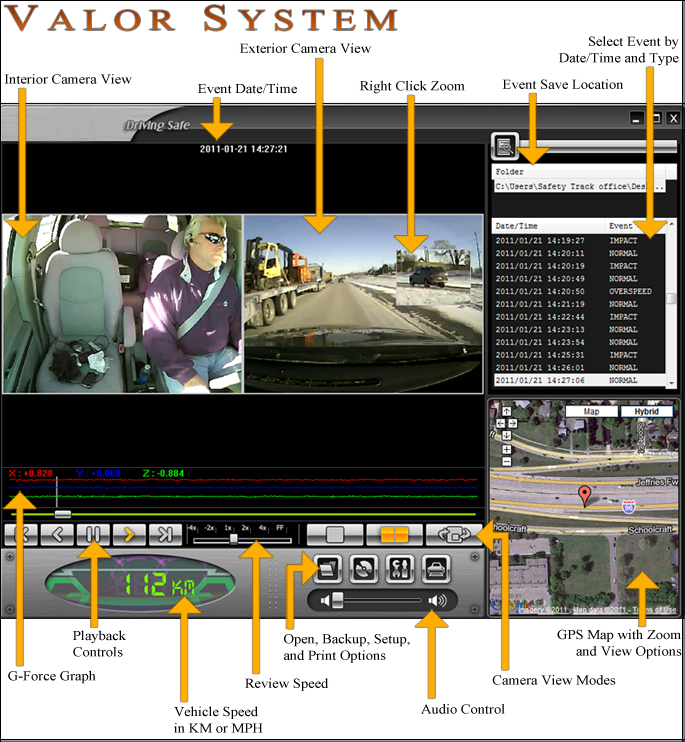 Consult the diagram below for complete labeling of the Car Camera DVR software’s features. 1. Can I review my own video? With the Valor System Fleet Camera, you are in control of YOUR Data. We feel that no one else can determine your needs better than your team. 2. How long will the camera record without overwriting video? There are multiple factors on this answer. Depending on the setting you set for your fleet camera, size of SD card that you are using, will impact the length of recording time. Using the default setting, a 32GB SD card will get you approx. 40 hours of record time. 3. Is there a reoccurring monthly cost? NEVER! Valor System feels it is your data, why pay someone else to manage it. 4. What are the camera angles of each camera? 5. Can I download the data without pulling the SD card? 6. How do you prevent employee tampering? Every Valor System Fleet Camera Comes with an anti-tampering bracket. This bracket will prevent employees from pulling the power cord, removing the SD card, or disabling the camera. Each Valor System Camera comes with a one year warranty on Manufacturer defects. Giving you the Peace of Mind you need. Always free and there for you. 9. Set up and installation. We know that not every company has a mechanic or IT Dept. onsite. Valor System can provide installation and set up of your Wi-Fi system. Have an IT dept, we can work with them, using our spec to ensure that your system is up and running in no time. Valor System’s new Waterproof Sports Camera, the Avenger, is the latest in Sports Camera Technology. The Avenger is equipped to handle up to 50 meters of underwater pressure with Full HD 1080P video quality. Now you can video all of your sports activities in full HD quality, and replay them for your friends. The Fleet Backup Camera has a 120° Degree viewable angle, its waterproof and has auto night vision. The camera is one of the most durable we have, with incredible adjustability and night vision clarity. The Fleet Backup camera has a metal sun shield visor to protect you from glare and debris. This is by far our toughest built camera. The Wireless Fleet Backup camera has a 120° Degree viewable angle, it’s waterproof and has auto night vision just like the other Backup Camera we offer. The only difference is that it is completely wireless and can have up to four Backup Cameras connected to it at once.